In 1953, John Gallagher and Ronald Robinson shook the foundations of imperial history with their essay ‘The Imperialism of Free Trade’. They reshaped how historians saw the British empire, focussing not on the ‘red bits on the map’ and the wishes of policy makers in London, but rather on British economic and political influence globally. Expanding on this analysis, this volume provides an examination of imperialism which brings the reader right up to the present. This book offers an innovative assessment and analysis of the history and contemporary status of imperial control. It does so in four parts, examining the historical emergence and traditions of imperialism; the relationships between the periphery and the metropolitan; the role of supranational agencies in the extension of imperial control; and how these connect to financialisation and international political economy. 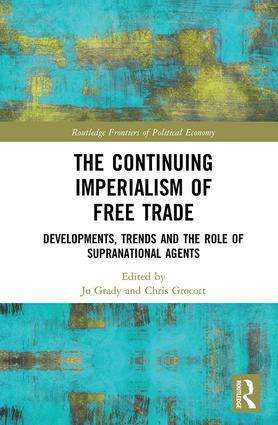 The book provides a dynamic and unique perspective on imperialism by bringing together a range of contributors – both established and up-and-coming scholars, activists, and those from industry – from a wide range of disciplines and backgrounds. In providing these authors a space to apply their insights, this engaging volume sheds light on the practical implications of imperialism for the contemporary world. With a broad chronological and geographical sweep, this book provides theoretical and empirical engagements with the nature of imperialism and its effects upon societies. It will be of great interest to a broad range of disciplines across the humanities and social sciences, especially those working in History, Politics, and Management and Organisation Studies. Policy as a tool of economic imperialism?